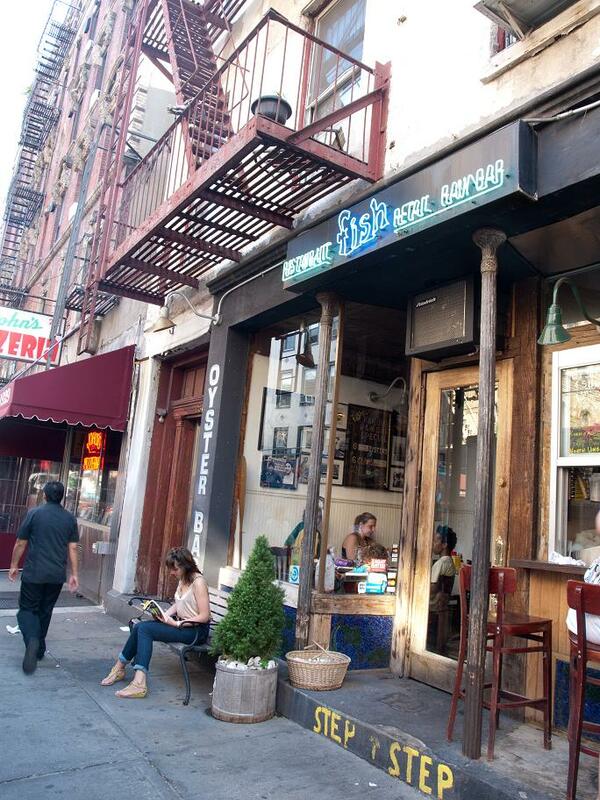 1) Best of Bleecker Street: After a day of shopping in the West Village, stop for a tipple at Blind Tiger Ale House. With their wide-open windows and doors (not to mention the extensive list of craft beers), it’s the perfect place to spy on the tiny Fish Restaurant across the street. When a spot opens up, head over for sweet-and-salty raw oysters and stone crab. If you still have room, head a few blocks down to Grom for a scoop or two of authentic and super-creamy Italian gelato in flavors like nocciola and tiramisu, then walk over to Washington Square Park and people-watch as you enjoy your cone. 2) Best Beer to Sip on a Stoop: Stoop-sitting is an age-old New York tradition, and one in which I’m proud to participate. My favorite summertime stoop beer is a bomber of Lagunitas Hop Stoopid. Intense and ultra-hoppy, this beer is not for the faint of heart, but its bitter finish makes it the perfect end to a hot summer day. 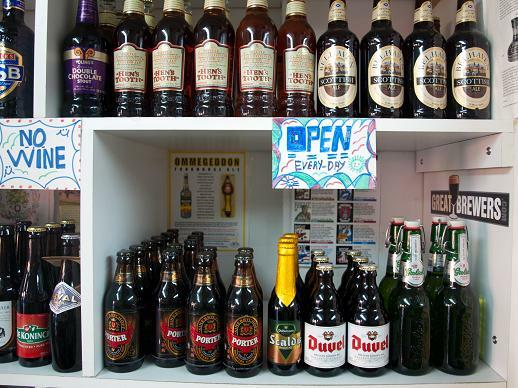 Pick one up at Hercules Fancy Grocery, a little bodega with a heroic international beer selection. Even if you don’t live in the ‘hood, there are plenty of stoops nearby on which you can sit. 3) Best Picnic Fare To-Go (in a bike basket for a long-distance ride): Last Fourth of July, my cousin Natalie and I biked up to Fort Tryon Park and The Cloisters, a four-hour round-trip bike ride. This past weekend, we set forth on a side-by-side tandem for a Brooklyn biking adventure, with victuals from Barnyard on Avenue C. Pick up a pressed speck and mozzarella sandwich on flautta bread, a side of roasted beets and a can of Limonata, and you’ll feel as juiced as Lance Armstrong. 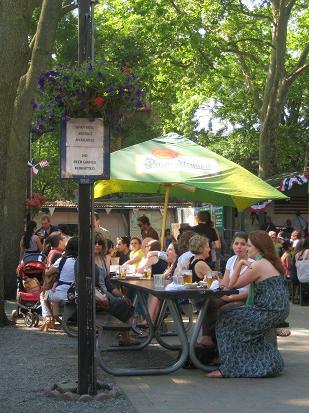 4) Best Group-Friendly Beer Garden: Who ever had just one beer at a beer garden? That’s how I feel about trying to choose just one beer garden for this list. If it’s a relaxed weekend afternoon with board games that you’re after, Astoria’s much-beloved Bohemian Hall will entice you with pitchers of Pilsner, crisp schnitzel and creamy stroganoff (not to mention occasional live music and a cute clientele). For more of a nighttime scene, try the new Biergarten at the Standard Hotel, where beautiful people and giant pretzels mix. There are fewer beers on tap, but that’s not why you are there, is it? When it gets too crowded to drink, head up to the High Line for a breezy walk along the former train tracks. 5) Best Iced Coffee to Pass a Day in a Dog Park: As everyone knows, New York is a city of voyeurs (see: High Line above, from which park-goers can allegedly see right into the rooms at the Standard Hotel). But if bedroom-peeking isn’t your thing, there’s always lusting after other peoples’ dogs. No feeding, no brushing, no walks and definitely no poop-scooping, but you can watch (and ooh and aww) to your heart’s content outside the fence of the Tompkins Square Park dog run. Sip Manhattan’s best iced coffee from 9th Street Espresso while the dogs run, fetch and splash in one of the park’s three pools. Tompkins Square Park: Avenue A at East 7th Street, Manhattan. Dog run, 9th street path. 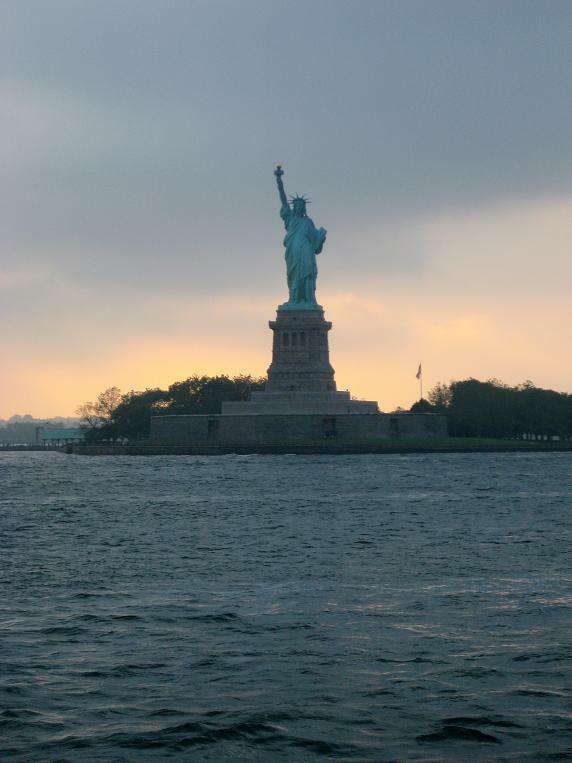 6) Best Panoramic Views of Manhattan: We’ve all been corrupted by chick flicks: In the urbanite’s dilemma, to really feel like you’re in New York you have to be looking at the Manhattan skyline, but for the best views of Manhattan, you have to leave the island. Rather than heading to Hoboken, make your way to Alma on Red Hook/Carroll Gardens border, where brunchtime on the roof deck means huevos Oaxaca and a sweeping view of skyscrapers, and dinner means pazole stew and sunsets. Oh, and tequila. Lots and lots of tequila. 7) Best Sculpture Garden/Junk Yard/Real Deal Mexican Feel: For overpriced guacamole, there’s Rosa Mexicana. For overstuffed burritos, there’s Uncle Moe’s. But for a night of chile-tinged revelry under the stars, there’s only Pacifico. Stake out the Cobble Hill patio with 15 of your closest friends, order some Baja tacos and a few pitchers of their bracing margaritas, and know that it’s the cinco de something, somewhere. 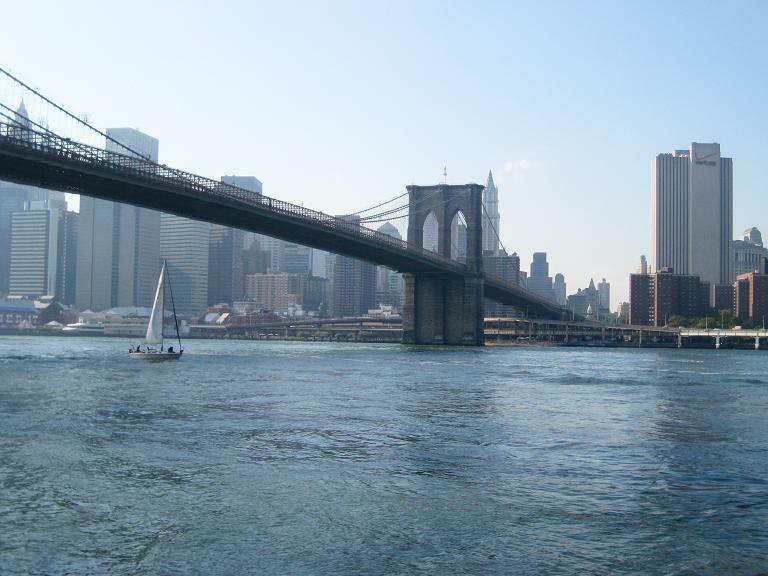 8) Best Promenade: Food isn’t usually the draw in Brooklyn Heights, but the views of the Manhattan skyline and the window peeping into the gorgeous 19th century brownstones are, so pack your own lunch and sit on bench on the Brooklyn Heights Promenade to take it all in…Statue of Liberty to your left! Later this summer, check out the new Pier 1 section of the Brooklyn Bridge Park, where concessions from Ditch Plains, Calexico and Blue Marble will satisfy any sweet or salty tooth. 9) Best Prayer Breakfast: Spread the faith by picking up a bagel and a favorite schmear at Hudson Bagels (everything, lox?) and walking a few blocks north to the gorgeous garden grounds at the Church of St. Luke in the Fields… not to be missed during cherry blossom season! You don’t need to have religion to enjoy the flowers, nor to explore their delightfully unfussy basement thrift shop, packed with the (often elegant) castoffs of their neighbors and parishioners. 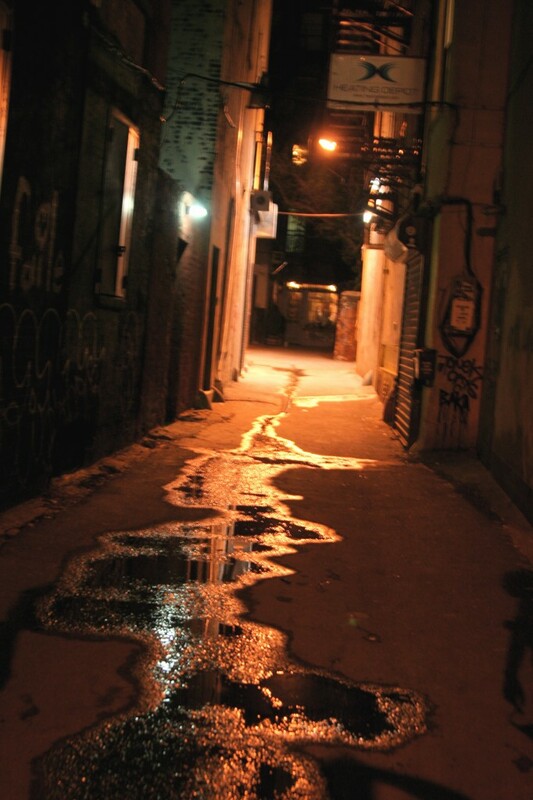 10) Best al Fresco Alley: If eating in an alley doesn’t sound appealing to you, well then you haven’t spent enough time in New York. Freeman’s may have popularized the trend, but Fette Sau has perfected it. Enter via a skinny alley of communal picnic tables, and line up with the rest of the outer-borough folk to load your tray with Berkshire sausage, pork ribs, brisket, sirloin tip, German potato salad, Guss’s pickles, to-die-for baked beans and potato rolls. If you still have room, try a whiskey flight, or better yet, take a constitutional and check out Spuyten Duyvil across the street, where a superb collection of rare and international beers awaits. If you haven’t had enough meat, their charcuterie is also deservedly famous. 11) Best Pretend European Getaway: Step into the glass-walled atrium behind August on Bleecker Street and it’s easy to pretend that you’re in the chicest bistro in Paris. Or is it the most elegant trattoria in Rome? On Saturday nights, dress up for stinging nettle vichyssoise, suckling pig and profiteroles; on Sunday evenings, dress down for Pies and Peronis (seasonal pizzas like asparagus with egg, parmesan and bottarga, with a Peroni to wash them down). Whether you’re looking for the City of Lights or the City of Fountains, August will fill in just fine, and you don’t have to spend eight hours in coach to get there. 12) Best Place to Picnic on a Pier: We’re not in Kansas anymore, and picnics aren’t just for parks. For a truly spectacular day on the water, stop by Murray’s for a few sandwiches, cheeses and cold drinks, and then head to Pier 46 at West Street and Charles. This not-your-average-pier has an astroturf lawn that is perfect for yoga and bocce ball, plus a plethora of picnic tables if you haven’t brought a blanket (pro tip: for a large group, reserve these ahead of time by calling the Hudson River Park Permit Office). After your Cambembert and cola, lay back and enjoy the view of the New Jersey shoreline, shared by two unusual suspects: the W Hoboken and the Erie Lackawana Steel Mill (a familiar site for a Buffalo gal–Lackawana, New York is just outside of my home town!) On Thursday nights, stop by for grown-up movies; Friday nights are ostensibly for kids, but I know plenty of adults who’ll show up on July 23rd for The Great Muppet Caper. 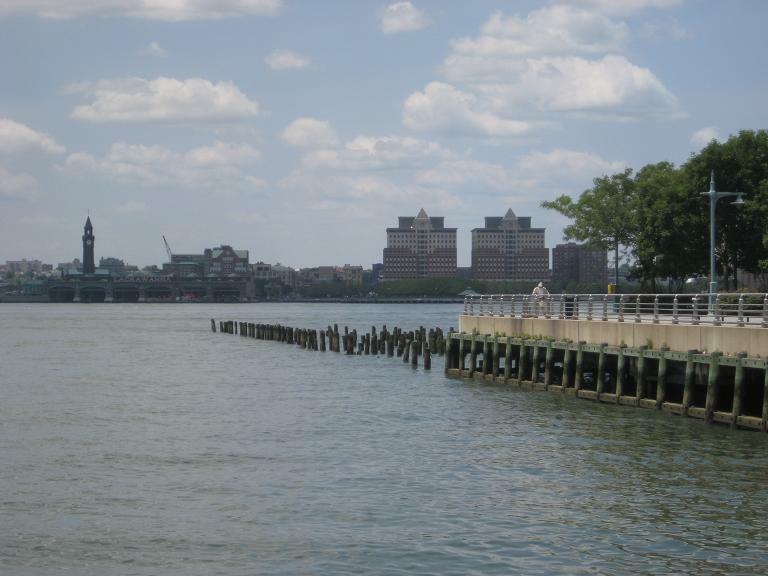 Pier 46: West Street at Charles, Manhattan. Check out their events calendar for more movie information.